This awareness design is available on our premium, pre-shrunk 100% cotton t-shirt, machine washable in youth sizes XS-L and adult sizes S-3XL. 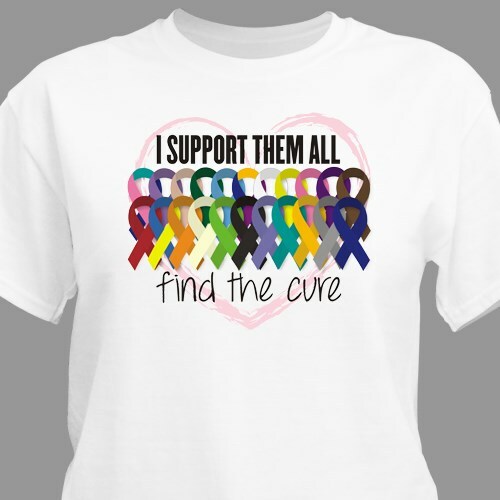 Cancer T Shirts, MS Shirts, Autism and more - all covered on this multi-colored ribbon t-shirt. I purchased this tshirt as a Christmas gift for my niece. She works for the American Cancer Society and is an active advocate for all cures. Quality of tshirt is good. Print is clear and colorful, as the description and picture indicate on the website. I love it! I have been wanting to order this for quite a while. High quality and perfect fit. Very pleased.